With a stay at Fiesta Americana Condesa Cancun - All Inclusive in Cancun (Zona Hotelera), you'll be a 3-minute walk from Aquaworld and 10 minutes by foot from Maya Cancun Museum. This 4-star hotel is 1.6 mi (2.5 km) from El Rey Ruins and 2.2 mi (3.6 km) from La Isla Shopping Mall. Make yourself at home in one of the 502 air-conditioned rooms featuring minibars and LCD televisions. Your bed comes with down comforters and premium bedding. Complimentary wireless Internet access keeps you connected, and satellite programming is available for your entertainment. Private bathrooms with showers feature complimentary toiletries and hair dryers. Pamper yourself with a visit to the spa, which offers body treatments and facials. You can take advantage of recreational amenities such as a health club, an outdoor pool, and a spa tub. Additional amenities at this hotel include complimentary wireless Internet access, concierge services, and babysitting/childcare (surcharge). Grab a bite at Cevicheria, one of the hotel's 4 restaurants, or stay in and take advantage of the 24-hour room service. Snacks are also available at the coffee shop/café. Need to unwind? Take a break at the bar/lounge, the beach bar, or the poolside bar for a tasty beverage. Featured amenities include a business center, complimentary newspapers in the lobby, and dry cleaning/laundry services. Event facilities at this hotel consist of conference space and a meeting room. Free valet parking is available onsite. Some rates at Fiesta Americana Condesa Cancun - All Inclusive are all-inclusive. These rates include onsite meals and beverages, and may include taxes and gratuities. Additional charges may apply for meals at some restaurants, special dinners and dishes, certain beverages, and other amenities. Lie back and work on your tan with relaxing beach amenities like umbrellas and sun loungers. 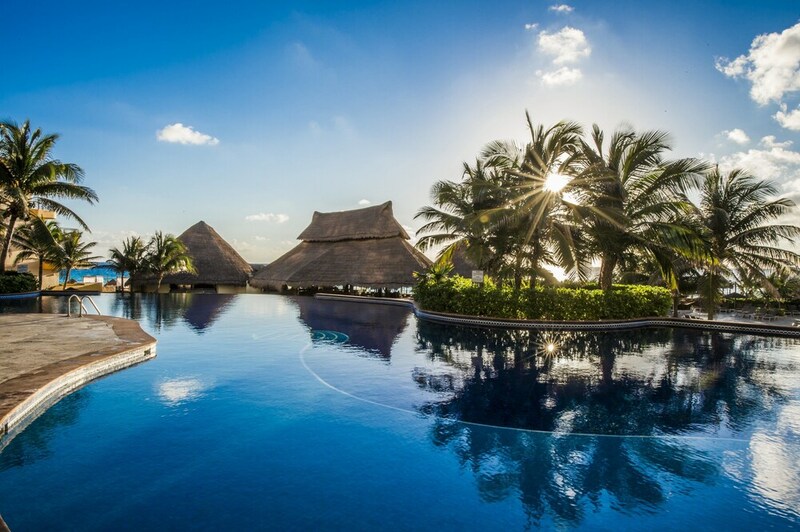 At Fiesta Americana Condesa Cancun - All Inclusive, pamper yourself with a treatment at the full-service spa or have fun in the sun with activities like surfing/boogie boarding and parasailing. Dining is available at one of the hotel's 4 restaurants and guests can grab coffee at the coffee shop/café. Guests can unwind with a drink at one of the hotel's bars, which include a beach bar, a swim-up bar, and a bar/lounge. Wireless Internet access is complimentary. This eco-friendly hotel also offers an outdoor pool, a children's pool, and a health club. Complimentary self parking and valet parking are available on site. Fiesta Americana Condesa Cancun - All Inclusive is a smoke-free property. Restaurante Kambu - This restaurant serves lunch only. Open daily. Kalmia Restaurant - This restaurant specializes in international cuisine and serves breakfast, lunch, and dinner. Open daily. Mexicano Restaurant - This restaurant specializes in Mexican cuisine and serves breakfast and dinner. Open daily. Rosato Restaurant - This restaurant specializes in Italian cuisine and serves dinner only. Open daily. Cevicheria - This bar specializes in Mexican cuisine. Open daily. An outdoor pool, a children's pool, and a spa tub are on site. Other recreational amenities include a health club and a sauna. Miiluma Spa has 11 treatment rooms including rooms for couples and outdoor treatment areas. Services include facials, body scrubs, and body treatments. A variety of treatment therapies are provided, including aromatherapy and hydrotherapy. The spa is equipped with a sauna and a spa tub.